On the morning of the ride, Dad drove up to Edmonds, WA to the Cascade Bicycle Club Registration Point. After failing the impromptu test regarding his bib number, he was still able to remember his name, and the registration people gave him his t-shirt and bib. At least now, if anyone asked his bib number, he could turn around and they could read it off his back. Then, with a slight squeal of the brakes, Dad was rocketing down the hill towards the ferry dock. 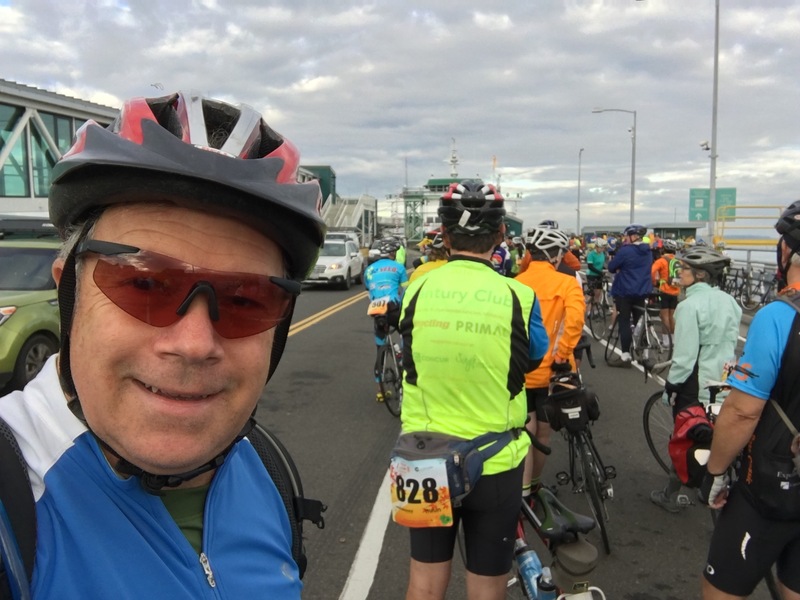 Dad decided to join the Cascade Bicycle Club for a tour around the Puget Sound. The trip started at the Fauntleroy Ferry Docks on Saturday morning. Dad met the other riders, and then the ride leaders explained the rules and safety precautions. Dad was decked out in his bright biking clothes and helmet and was ready to go. This was not going to be an easy task. Bicycle fitting is a tricky business in the first place. It’s more art than science. And Kimi is very particular about how things fit, so she was not about to compromise on this purchase. And Kimi is not tall, so she is usually looking at the smallest sized adult frames, which not many bicycle shops have in stock. Mom-mom, Dad, and Kimi all set out together to buy a new bike for Kimi. Her old bike from her middle school days had seen better times, but it had carried her all through her years at University of Oregon. U of O’s home town, Eugene Oregon, is one of the top bike theft capitals in the world. So she had never opted to upgrade her ride during her college years. That way if they stole her bike, they wouldn’t get much. Now that she was a freshly minted graduate with a paying job, Kimi was ready to move up in the cycling world. She had a pretty good idea what she wanted, dropped bars and disc brakes, but she wasn’t sure what kind of frame or gear set she wanted. She would just have to try a few until she found a set-up that she liked. Kimi wanted to practice with a dry run first. She thought riding her bike to work would be a fun way to get some exercise. Wisely, she did not want to pioneer the route on a weekday, when she would have to face gobs of traffic and risk being late to work. She approached Dad about taking a ride to downtown on a Sunday.